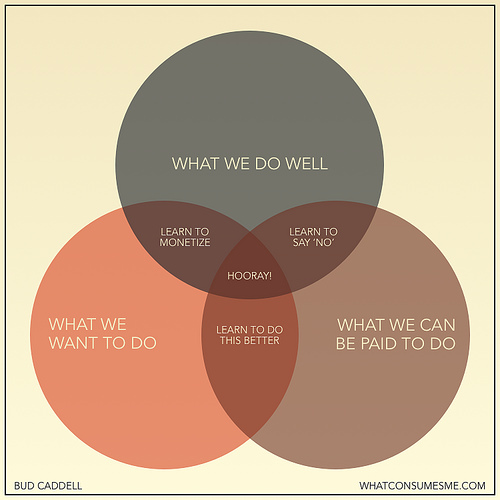 I like that the diagram isn’t symmetric: the “learn to monetize” segment directs you to move those activities to the center, as does the “learn to do this better” segment. But when you are doing something well, and getting paid, but it’s not something you want to do, the instructions aren’t to learn to like it: they’re to say no. I love this, as I've often commented on the exact same three sets being disjoint for many people. I think the suggestion to monetize what you do-well/want-to-do is OK, but I'd rewrite the other two. If you have something that you want to do and can be paid to do, then "stop caring about whether you're any good" is an alternative (and one often taken in the entertainment industry, I might add). If you have something you do well and can be paid to do, "use it to underwrite your hobby" and "seek early retirement" are alternatives. this picture is really worth a thousand words. explains a lot. love it. How can you apply the verb learn to a venn diagram? Mabye my math is rusty.